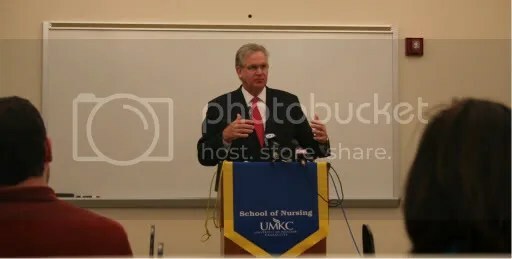 The program was established by the Missouri General Assembly in the Fiscal Year 2010 budget – providing forty million dollars to help increase health care training capacity in Missouri colleges. 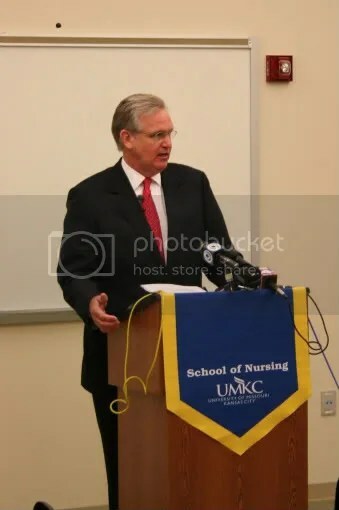 Governor Nixon speaks with nursing students at a remote site and in a classroom at the UMKC School of Nursing. 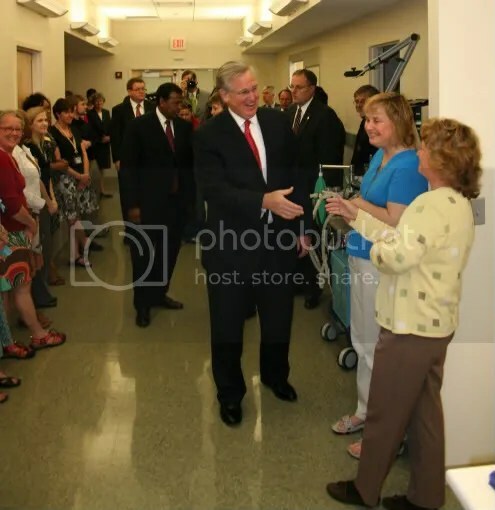 Governor Nixon greets individuals in the School of Nursing on his way to the press conference. The Kansas City ABC affiliate had a crew in attendance at the press conference. Senator Joan Bray, D-St. Louis, just finished her seventeenth session in the legislature (ten in the House) and will be termed out of the Senate in 2010. Tuesday night she offered the Bonhomme Township Democrats her take on the just completed session. She called this one unique because having a Democratic governor “made life much more bearable”; because there was new leadership in the House and Senate; and because in the Senate, where more time is allotted for an individual to talk and even filibuster, the Republicans have begun fighting among themselves. The infighting is a natural evolution once a party has been in power for a few years. Republicans, in their sixth or seventh year in the majority, she said, have gotten the hardline policies enacted (changes to tort law and workmen’s compensation, cutting people off of Medicaid, and increased abortion barriers). Now they’re down to their third tier issues, so they start disagreeing. Where I spent my first six years in the Senate filibustering a lot, this year, they were filibustering their own bills. And Senator Days and I remarked one day that we actually got to–when they brought in supper for us because we were staying late–we actually got to go into the lounge and have supper with everybody else because we weren’t out on the floor having to keep the conversation going for fear something bad would happen. In these very, very acrimonious debates, some of the worst moments on the Senate floor since I’ve been there took place this year of Republicans against Republicans. A transcript is below the fold, but don’t depend on that alone. When Bray gets started on the House Budget Committee, it’s almost like watching a cross between a preacher and a standup comedian. My observation of, of, of … that the processes just don’t work as well. People don’t know the rules. And there’s reasons for all those rules, for doing things the way they’re done. And because there’s nobody left in the House who has, you know, a long, in depth knowledge and experience of working [garbled], knowing how things should get done, it’s gotten very sloppy. And when they come to the Senate from the House, they have a real hard time adapting to the different ways of the Senate, and it’s just … right before we went on spring break, like the night before we went on spring break, I just … said, you know, we’re a mess. I mean, we were just a mess. People didn’t know how to make a motion, they didn’t know how to talk, they’d be laughing and talking with each other on the floor when …. None of this is allowed when you’re trying to [garbled]. 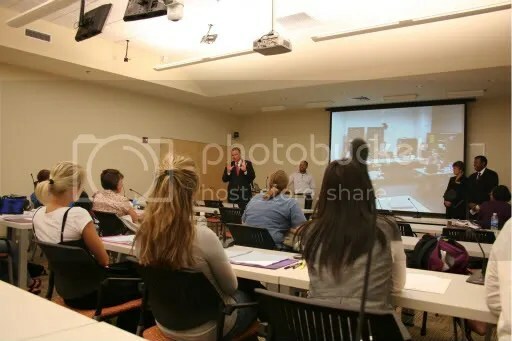 Anyway, the Secretary did some remedial classes with the folks, [laughter] trying to get things back on, you know, the way things should be done. But I, you know, I, when someone like me and my class are going out [inaudible]. Uh, let me talk a little bit about the budget. I spend most of time working on the budget. I’m the ranking member on the Appropriations Committee. And we’re organized a little differently from the House [inaudible]. The House has several appropriations committees and then the Budget Committee. And they do their work, and they send it over to the Senate Appropriations Committee. We’ve gone through the budget all along, and we go through it another time and go through it another time and then go off to conference and get it done. This year was a huge different environment because of, first of all, the state shortfall in general revenue. Which I’ve experienced before. I was here in the early part of this decade when we spent night after night after night trying to figure out where we could squeeze a few dollars out here, there, wherever, and foresaw that was gonna be the case this year, but then that great, you know, fairy godmother called Washington D.C. sent down this stabilization money and stimulus money. And, uh, that was real interesting exercise. Uh, thank goodness the nut cases in the, in the Republican party didn’t prevail, so we did … take … the money. 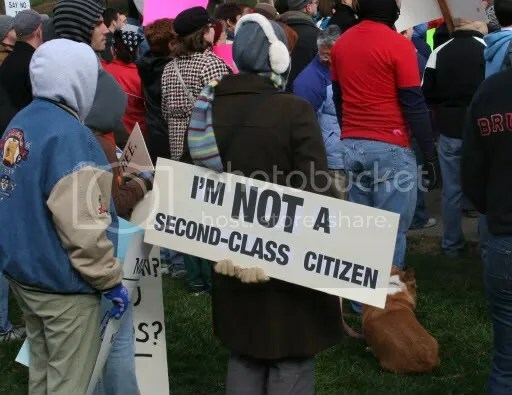 [Laughter] You know some states didn’t. And I thought we did a fairly good job of [inaudible] the budget. I will, not to disparage my sister’s [puts a hand on Rep. Jill Schupp sitting next to her] uh, uh, body, but the House, well, I want to tell you, it’s been a real trip watching the House budget the last six, seven years. Omigosh, I’ve had, I mean… ‘How shall we do it this year? [waving hands in the air] How shall we do it…? You know, what’s a [inaudible] We recreate the wheel every time we do this. It’s just crazy. There is a good [inaudible]. The Senate did a, the Senate Appropriations Committee did a really good job crafting a budget. We tried to, with the general revenue we had, we tried to fill the gaps in services, using stabilization money from the feds, and, uh, you know, tried to do it real thoughtfully and carefully, and I think came out with a really good budget. But then we had to go to conference, and the Senate can’t win on everything. The House, with its crazy budget, had to win on something. And as a result, they won on things that were just heartbreaking, that did not have to happen. Like, we did not have to cut 500 people off alcohol and drug services. 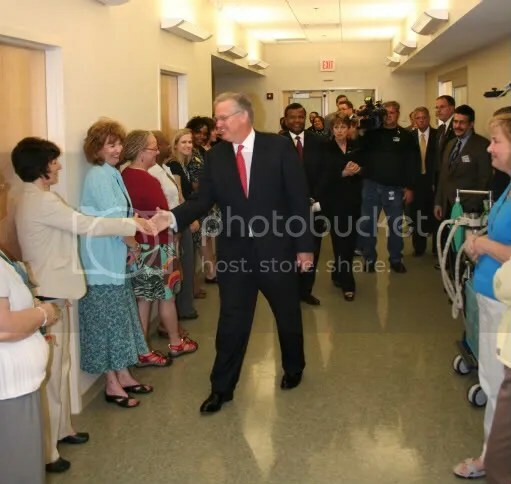 We didn’t have to cut 600 people out of mental health services and close eleven community health centers. We didn’t have to do that. But because they had to win on some things, guess where they cut. You know, they went on with the cuts in mental health and alcohol and drug treatment. So that was really discouraging. But by and large, the Senate prevailed on the budget. We did use the stabilization money properly. I can see why Bray got elected. She’s a live one, who–as it just so happens–also takes her job seriously. 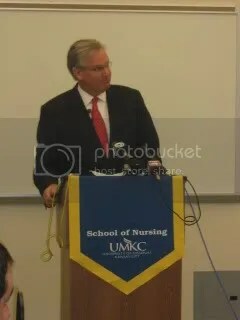 Governor Nixon came to Kansas City today to do a quick tour of the School of Nursing and conduct a press conference at UMKC to introduce Caring for Missourians, a new initiative that will train more than 900 additional high-demand, critically needed healthcare professionals each year. 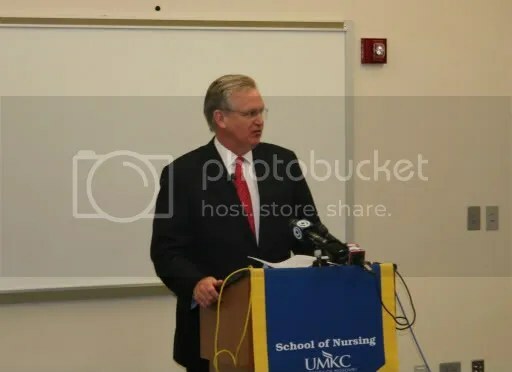 He chose to introduce the program at UMKC because it is the largest recipient of funds that will go to 26 two and four year schools and professional programs all over the state. UMKC is the largest recipient because it is the only institution that has all the programs that are part of Caring for Missourians on one campus – Nursing, Dentistry, Pharmacy and Medicine – as well as a full compliment of the allied health professionals like clinical laboratory science and occupational therapy. Missouri is facing a dearth of qualified healthcare providers,especially outstate. Let me put that in perspective – we are a state with 114 counties, and 79 of them have provider shortages. 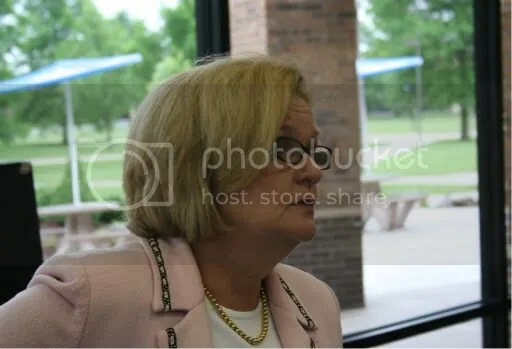 This morning in Sedalia, Senator Claire McCaskill (D) held a town hall meeting, taking questions from the audience on the economic recovery (and other issues), in the Parkhurst Commons, Stauffacher Building on the campus of State Fair Community College. There were approximately one hundred fifty people in attendance. After the meeting ended she spent a few moments taking questions from the media. A transcript of that press opportunity follows. Transcripts of the town hall meeting will appear in subsequent posts about the hour long event. …Senator Claire McCaskill: Well the most important thing is job creation. You know, we’ve got a, a recession is obviously a retraction, where people lay off people, and, and hunker down, get smaller. We now have to turn that corner and see that growth. We’re beginning to see the green shoots of growth. I think the stimulus money has helped. I think the TARP funds have helped in terms of loosening up credit. And now it’s just a matter of us continuing to put one foot in front of the other. I think in another eighteen months we should be back to where we were, maybe not when the recession began, but certainly in a much healthier position. Question:…like they were twenty five years ago? Senator McCaskill: Well we have to have some kind of regulation over investment banks. When we unhooked investment banks from regulation everyone thought, well, if we just let ’em go, they’d only act in their best interests, ’cause it’s not in their best interests to, to over leverage. Or to slice and dice exotic security instruments. To the point that nobody even understood what they were buyin’ and sellin’. But it made their salaries go up. So yeah, we’re gonna have to have some more oversight there. The tricky part is making sure we don’t go too far. We don’t want to squeeze the life blood out of the economy by over regulating, but obviously, we’ve gotta have some kind of framework of regulations in place. Senator McCaskill: Well that would. The company you refer to, we did help. 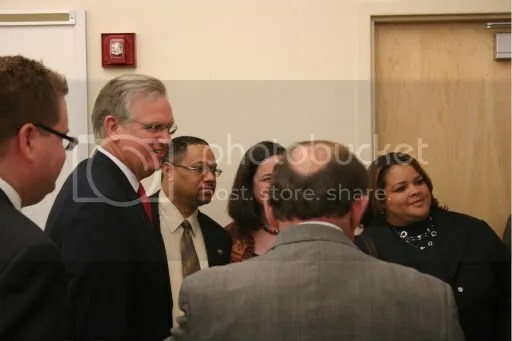 And were, they were able to get a reprieve because we made an effort to try and intervene and at least talk to the, their creditors and explain that. And that’s what’s happened, when this, when credit retracts companies that are profitable, that are employing people, actually end up having to shut their doors. And this was a situation that this was the case. I mean, this wasn’t a company that was in economic distress. It was just, they weren’t able to get the credit they had gotten before. And so we were pleased that we were able, I think it was seven hundred jobs? Seven hundred jobs out there that we were able to hold on to. And, in fact, I was gonna try to get by there today, and I’m just not gonna have a chance, but hopefully some of them were here. Show Me Progress: What, what are the prospects of for procurement oversight with, with your subcommittee, in making accountability more permanent? Senator McCaskill: Well I think we’ve got a lot of work to do. And I am, it’s almost unhealthy how excited I am about the opportunities we’re gonna have in that committee. We’ve got waste and fraud and abuse in almost every agency in the federal government as it relates to contracting. No one’s been minding the store. No one’s been watching the contractors. I mean just between Department of Defense and Homeland Security you have contractors watching contractors that are writing their own contracts and getting performance bonuses on contracts where they didn’t perform. It is really almost like, it, it’s nuts how out of control it has been. So, it, there’s so much work to do and I’m excited that we’re gonna be able to have some hearings. I think the hearings we have are gonna be dramatic and I think they’re gonna help. We have one coming up on, on ANCs, which is a thing that was created to allow cer…, certain corporations [to] not compete at all. We have some other hearings coming up as it relates to cost plus contracts and oversight of them. Cost plus is a contract where the contractor gets to make whatever the contract costs him plus. So, I mean, where’s the incentive there? I mean, it’s like, okay please, let me take more taxpayer money than I need to, if I’ve got a cost plus contract. When you look at the LOGCAP contract alone in Iraq, which is the KBR contract that has become so famous. That was cost plus, noncompetitive in the beginning, and they were writin’ the contract. And, so no wonder that they were monogramming hand towels for the battlefield. Show Me Progress: So, what do you believe are the prospects for, for fixing this? Senator McCaskill: I think they’re pretty good. I have been encouraged by Secretary [of Defense] Gates’ commitment in accountability. He has fired generals. On accountability issues. 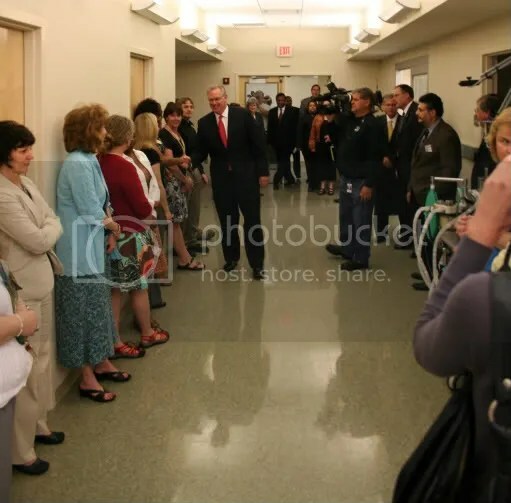 He got rid of the general that was over Walter Reed [hospital] when we realized that that situation had run amok. He got rid of the head of the Air Force. There was a bad contract there. There was some insider taking care of a friend contract. And he, he, unlike some of the secretaries of defense before him, he is not content to let the low level folks get in all the trouble. He holds the people at the top accountable. And in the budget he announced he has a huge plus up for acquisition. Somebody said to me. “Well you don’t want to grow government. Why are you doing acquisition?” Said, “Are you kiddin’?” That’s exactly the problem. We have to have government people who understand contracting, that know how to oversee it, so his announcement of additional personnel in acquisition was music to my ears. Question: Senator, what would you like to see happen with Guantanamo Bay, in your opinion? Question: Our prisons are secure. Senator McCaskill: Our prisons are very secure. We have terrorists right now in America in our prisons. Dozens of ’em. And they are secure because we don’t let dangerous people escape from prisons in America. I’m hopeful still that the vast majority of those folks will be placed other places than America. And I think that there is a, a likelihood that may happen. So I think Guantanamo will close, it should close. It is going to take some time. And I think just because the President announced he was gonna close it, I think everyone understood that he set the right tone when he announced he was gonna close it right after he was inaugurated. But that doesn’t mean he’s not gonna do it carefully and with caution. And that’s what you’re seeing now. 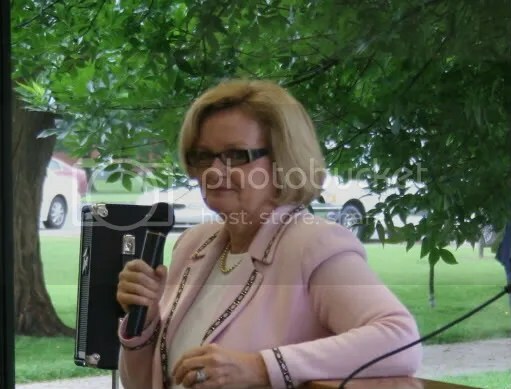 Senator McCaskill: Thank you guys. 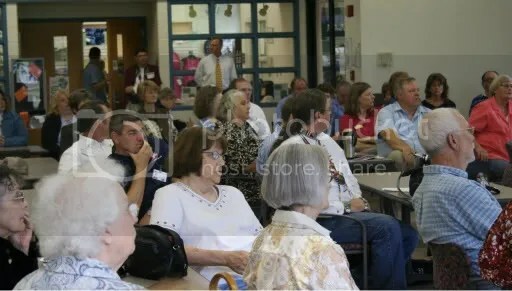 A part of the audience listening during the town hall. John Greenleaf Whittier wrote: “For of all sad words of tongue or pen, the saddest are these: ‘It might have been! '” Public policy makers bear a heavy–usually unacknowledged–burden in the “might have been” department. Suppose, for example, this state took public education seriously. Sarah Burd-Sharps, one of the authors of The Measure of America, is giving you a way to see “what might have been” if education were better. She wrote to tell me about a new, interactive site that she and her colleagues have designed. 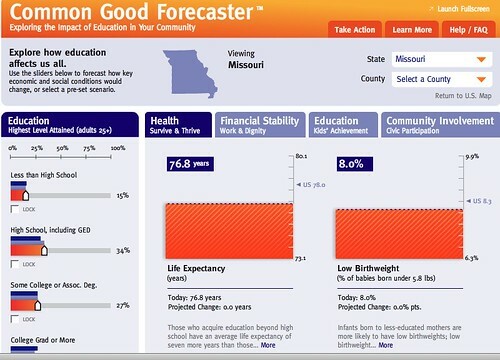 Click on Missouri when the site map comes up, and you will see along the left edge what level of educational achievement Missourians now have. You can use the mouse to move those levels up and see how our lives would improve. From the tabs along the top, you can choose to learn how health, financial stability, education (kids’ performance in school) and community involvement would change. Looking in particular at Missouri, you can see that if all adults 25 and over in the state had graduated from high school, average earnings would rise $1,000/person, 70,515 fewer people would live in poverty, 156,000 more people would vote and there would be 22,577 fewer prisoners. In the arena of education, Burd-Sharps bemoans first the way Americans expect their educational system to handle all the problems that children bring to school with them. If they arrive hungry or if they come from a situation that is violent or abusive, we can’t expect teachers to solve those problems. Because poorer districts face more such problems, they need more funds if they’re to make any headway in teaching those kids. Yet their funds are less because the U.S. is one of the only countries that bases its educational spending on property taxes. $6,000 annually for public four-year college tuition, vs.
$25,000 a year per inmate. If we spent the necessary money to get most people to graduate from high school, the state would save over $564 million every year on its prison system. Maybe it would take that much money to get everybody to graduate. Maybe we’d only break even financially. Maybe the only reward we would reap would be feeling less threatened by crime and knowing that lives which might have been ruined are now productive–thus creating a state, by the way, that would lure companies with well paying jobs to offer. But the rewards for educational spending would be years down the road, long after the legislators who voted for it were termed out. If the Republicans who control our legislature had that much vision, they wouldn’t be Republicans. All we can do is work to elect Democrats and hound them to improve educational spending, knowing that unless we keep up, other states and other countries with wiser policies will reap the rewards of better education. 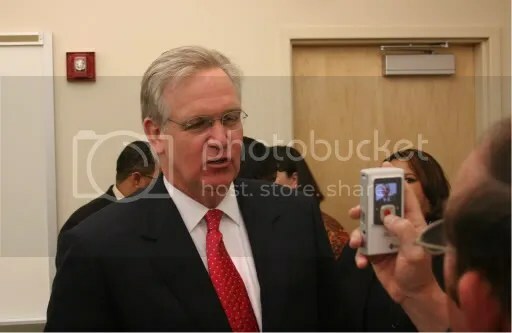 State Senator Gary Nodler is expected to run for Congress, which would be more shocking, if it didn’t happen in 1996 (losing to Roy Blunt) and 1988 (losing to Mel Hancock). Nodler’s opponents, so far, are St. Sen. Jack Goodman, Auctioneer Billy Long (who would be a force to be reckoned with in one minute speeches), Greene County prosecutor Darrell Moore, and College Instructor Jeff Wisdom. No word on how many more Republicans will show up here. I’d need to check the math, but the Joplin/Springfield split could get Goodman elected if he can carry his district. And no word on which Democrats are going to run in this district (which Hulshof won, and which I think Hubbard defeated Robin Carnahan). In Germany, every citizen is mandated to purchase health insurance through government organized Health Funds, unless your income is above 48,600 Euros per year, or approximately $68,000 at current exchange rates. If you make over the threshold, you may purchase health insurance from private insurance companies. Approximately 90% of Germans purchase their health insurance through the government administered Health Funds, many of whom have the option of purchasing private insurance instead. Knowing these facts, if I told you there was a city where 94% of the insured purchased insurance through one provider, and the next largest provider insured only 2% of the insured in the metropolitan area, you might think we were talking about a German city where fewer people met the threshold for opting out of the government system. But I’m not talking about Germany – I’m talking about Joplin, MO! 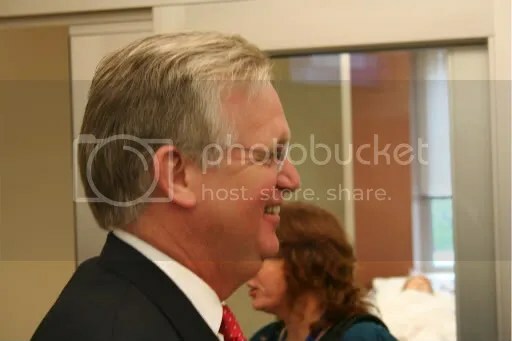 The major provider, Wellpoint, Inc, the largest health insurance company in the United States, insures 94% of all policyholders in the metropolitan area of Joplin. That’s a city in the “free market” health care system here in the US, right here in Missouri. 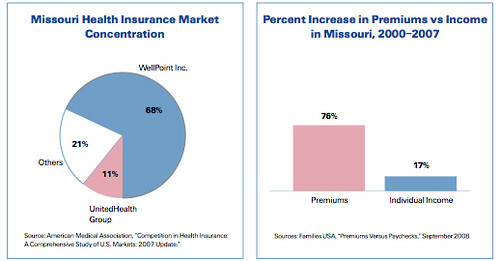 For Missouri as a whole, Wellpoint insures 68% of the population lucky enough to have health insurance. Now, to be clear, I don’t have a problem with the market share per se – if a company is awesome and provides quality, affordable health insurance for its policyholders, making sure that they have access to effective treatments, pooling risk and employing other cost containment measures to make sure prices don’t skyrocket, well then, that would be worth high praise. But as you can see from the graph below, costs are spiraling out of control. The average premium has increased 76% (!!) in the last eight years, while incomes have risen only one quarter that rate. And lest you think these premiums were going straight back into investing in increased quality, think again. As market share increased, Wellpoint’s bottom line rose by a staggering 1,380%! During the same time, Missouri continues to lag behind other states in terms of quality and access, ranking 37th overall in a Commonwealth Fund health care report. It’s pretty clear that the “free market” has failed us in terms of quality, access, and affordability. It has allowed the favored few to create a bigger pool for themselves to play in, while we get stuck with the bill. That’s why we need a public plan to offer a real option for Americans to get quality affordable health care. If the health insurance companies think that competition is the best way to deliver quality health care, they’ll actually have to start competing against someone who aims to deliver it. More on the public plan tomorrow. I don’t know what Chad is whining about here. And to be fair, it’s not necessarily clear that he is whining at all. He may be completely unaware that retweeting, or reposting someone else’s comment on Twitter, usually carries with it your stamp of approval even if it’s attributed properly. Demonstration at the J.C. Nichols fountain in the park at 47th and Main in Kansas City on November 15, 2008. They cut the baby in half. You can bet there’ll be more. Will Bond Vote Against Cloture on Sotomayor's confirmation?